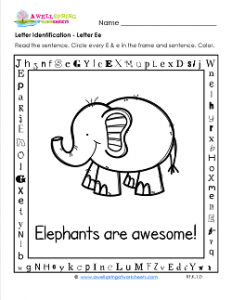 The elephant on this letter identification page is just a little guy but he’s got big ideas of how your kids can find all the uppercase and lowercase e’s on this page. Keep your eyes on the frame and trace it’s outline. Look at each letter very carefully and when you get to an E or e circle them! Don’t forget to look in the sentence “Elephants are awesome!” because you’ll find some more there. Circle those, too. All together you’ll find 17 e’s – 12 in the frame (three on each side) and five in the sentence. Don’t forget to have your kids look for the hidden sight word “in”. It’s in the bottom part of the frame.